With the recent movement to normalize and support those suffering from mental illnesses, Alex D'Lerma’s Fear, Love, and Agoraphobia could not be a more timely or necessary film. Society has always stigmatized those with mental illnesses, and film has, generally, not been kind in their portrayal. Many of film’s characters afflicted with mental illnesses have been deemed “crazy,” shown to do kooky, unexplainable things, or, if they’re not silly caricatures, they’re menacing and terrifying and villainous; cartoons or murderers were the only two options available for those with mental illness on screen. 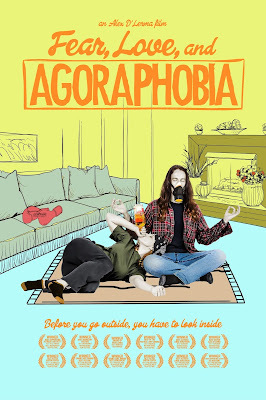 Enter D'Lerma and his compassionate, gently written, but emotionally impacting story of an anxiety ridden agoraphobic man, Chet (played with aplomb by Dustin Coffey), who finds a friend in an alcoholic former Marine, Maggie (Linda Byrzynski). The script, performances and direction combine to create a loving, lovely film that embraces those characters and gives the audience a more true to life glimpse at how those suffering from mental illnesses live their daily lives. Dustin Coffey’s performance, in particular, stands out. Chet is nuanced, he is not just his illnesses, he is a fully fleshed out, multi-dimensional character who feels everything deeply, not just things he associates with his multiple diagnoses. Coffey allows himself to be completely vulnerable, this is especially noticed in one scene nearing the end of the film; he gives himself completely over to the character and that makes the scene all the more impactful. Having spent the film getting to know Chet as a human being, seeing his struggle when his afflictions come out in full force is truly heart breaking and hard to watch. Byrzynski also comes out swinging, presenting a strong, but damaged character, who, like Chet, is deeper than her issues. Her frustration with the hand she’s been dealt is palpable and relatable on a wide scale, allowing those who may not have experienced her exact issues to empathize with her character in other ways. Both of the lead actors in this film are stunning in their vulnerability and in the loving way they’ve presented their characters. D'Lerma’s script and direction do not shy away from the horror and trauma suffered by those suffering with mental illness, but neither are exploitative in the slightest. The film, while dealing with extremely heavy subject matter, is light and, at times, funny, because that’s how life is. The film is shot in such a way that the world around the characters is bright and open. The use of natural light is key in showing that what’s happening on the inside doesn’t always appear on the outside; one of the film’s key moments happens on a beautiful, sunshine filled suburban street, a place that would feel safe to most, but not to Chet. Each little piece adds another layer of understanding for the audience. Following the trend started by David O. Russell’s 2010 film, Silver Linings Playbook, D'Lerma’s film tells the story of two people, both dealing with their own issues, who find a common bond and begin to trust each other. One can only hope that the gentle, true representations of mental illness in film continue. Giving an audience this kind of look into what every day mental illness really is can only aid in the de-stigmatization of those suffering, and if the film itself is well written, well directed, and, especially, well-acted, what audience member wouldn’t want to watch? D'Lerma’s film is a love letter to a part of society often overlooked and it’s not to be missed.